“Good gracious has Rosslyn changed!” a friend who rarely crosses the river exclaimed to me recently. Yes, it has, and remarkably at that. As a resident of the North Arlington neighborhood above Rosslyn (Courthouse), I have been personally privy to being exposed to the constant progress in retail, corporate and residential over the past several years. It’s been a pleasure to watch and patronize. And no, it’s not nearly done yet. Yet the neighborhood once known simply as “a concrete jungle” is very community focused, embracing its burgeoning number of affluent residents with weekend food, beer, jazz festivals that are family and dog-friendly as well. In the spirit of the holidays, next up on the festivities docket is Rosslyn Business Improvement Districts’ (BID) third annualÂ Holiday Market, which is scheduled fromÂ 10 amÂ to 6 pmÂ onÂ Thursday, Dec. 10Â andÂ 10 amÂ toÂ 8 pmÂ onÂ Friday, Dec. 11Â in Rosslynâ€™s Gateway Park. 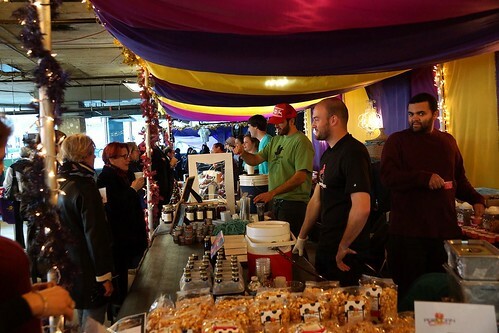 Pamela’sÂ Punch: How did Rosslyn’s Holiday Market come about? What made you decide to launch the event? PP: How has the market evolved since it was started? Why do you think it has changed over the years? MB: Much like the neighborhood itself, Rosslynâ€™s Holiday Market has evolved, each year building on past successes and incorporating exciting new elements â€“ from live entertainment to beer and wine sales. All of the elements we have added are designed to bring people together, create a festive environment and have fun as a community. As weâ€™ve added activities and experiences that have people staying longer, the event has evolved into more of a Holiday Festival then just a market. The Rosslyn Holiday Market continues to draw in residents, workers and visitors, and each year we are looking for innovative new ways to create memorable experiences in Rosslyn. PP: What’s new about this year’s event? Are there any exciting elements that are not to be missed? MB: This yearâ€™s market is definitely different from anything weâ€™ve done before and the event really has something for everyone. On Thursday, December 10, weâ€™ve scheduled a special Pop-Up Bootcamp so attendees can start the holiday season guilt-free with an hour of High Intensity Interval Training (HIIT). We also have winter-themed crafts and games, free photos with Santa and a Children’s Storytime hosted by The Reading ConnectionÂ so you can drop by for some fun with the little ones. On Friday, December 11, weâ€™ll liven things up with an evening performance by Jeff From Accounting and beer and wine sales from Washington Wine Academy. Perhaps the most exciting element of this yearâ€™s event will be Friday nightâ€™s festivities that include a bonfire and D.J. in Gateway Park West, complete with beer and wine sales. Weâ€™re even incorporating a mobile event bar, and this type of setup allows us to explore new concepts for our public spaces and move toward semi-permanent structures for events at the park. The Rosslyn Holiday Market Festival is the perfect event whether youâ€™re looking for an activity to entertain the kids, some live jazz to get in the holiday spirit, or exciting plans for date night. PP: There’s always a big push to shop local during the holidays. Is that a focus at the Rosslyn Holiday Market? MB: Definitely. We do everything we can to support local businesses, be they brick and mortar retail stores, food trucks or the increasingly popular fashion trucks that visit the neighborhood. As in past years, this yearâ€™s Rosslyn Holiday Market Festival will feature a host of unique and local vendors showcasing everything from knitted baby hats and hand painted ornaments to jewelry and gourmet holiday popcorn. Our goal is to give vendors an opportunity to showcase their gifts and provide Rosslyn residents and workers with a one-stop shop where they can meet all of their holiday needs. PP: Is the Rosslyn BID doing anything to give back during the holidays? Does your organization support any specific charities? MB: Iâ€™m glad you asked! Our annual holiday market would not be complete without the opportunity to give back to our local community.Â In the spirit of the holidays, the Rosslyn BID is conducting our annual holiday clothing drive to support A-SPAN (Arlington Street People’s Assistance Network). As we do each year, weâ€™ll be collecting donations of new or gently used winter coats, sweaters, sweatshirts, hats, gloves and jeans to donate to the organization, so be sure to look for a gift-wrapped donation box in the lobby of buildings throughout Rosslyn. The clothing drive ends on the last day of the market,Â December 11, and A-SPAN will have a booth at the market so attendees can drop off donations and learn more about supporting the organization. Next Iconic Three Generation Family Owned & Operated Business Tiny Jewel Box Cuts the Ribbon!